In 1893 Chicago hosted the World's Fair. How could Chicago make a lasting impression on the world after Paris revealed the Eiffel Tower at the previous World's Fair? A contest was held, and George Ferris Jr. from Pittsburgh submitted his idea for an 834 foot circle made of steel alloy with passenger cars attached. Each car was "the size of a living room, with enormous picture windows and forty velvet seats." Children will be amazed by the story behind the Ferris Wheel. At the time, people thought it was a crazy design, architects predicted it would collapse, and the World's Fair wouldn't give Ferris the money for building material. Yet on June 21, 1893 the Ferris Wheel opened. It was covered by 3,000 light bulbs and gave passengers a ride 265 feet into the sky for a glimpse of the city of Chicago and Lake Michigan. Davis structures the text of this nonfiction picture book in two ways. 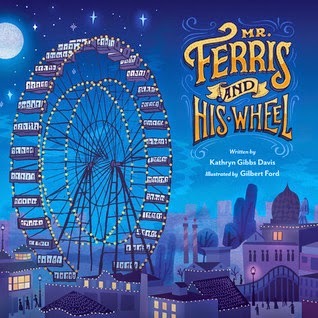 There is a narrative main text, which tells the story of how Ferris came to design and build the wheel. 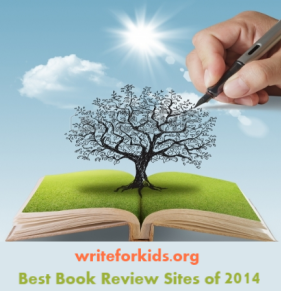 On the right side of the pages are quotes and expository paragraphs containing interesting facts. "During the nineteen weeks the wheel was in operation, 1.5 million passengers rode it." Ford's deep blue and purple illustrations are rendered in ink, watercolor and digital mixed media using Adobe Illustrator. By using both watercolor and digital media, the illustrations have depth, and the foreground stands out from the background on many pages. Davis' research is evident on the last page which contains quote sources and a bibliography. Mr. Ferris and His Wheel would make an interesting nonfiction read aloud for elementary children. The story is the perfect blend of STEM and history that will inspire readers to dream big! Read about the process of creating the artwork for the book on Gilbert Ford's blog.